Does cannabis cure cancer? Substantial trials in humans have yet to be completed, but over laboratory and animal studies suggest there’s potential. It’s unlikely that you’ll find a medical professional or scientist that will own up to the idea that cannabis cures cancer. However, there is a rapidly growing body of evidence that proves that the herb has serious anti-cancer potential. 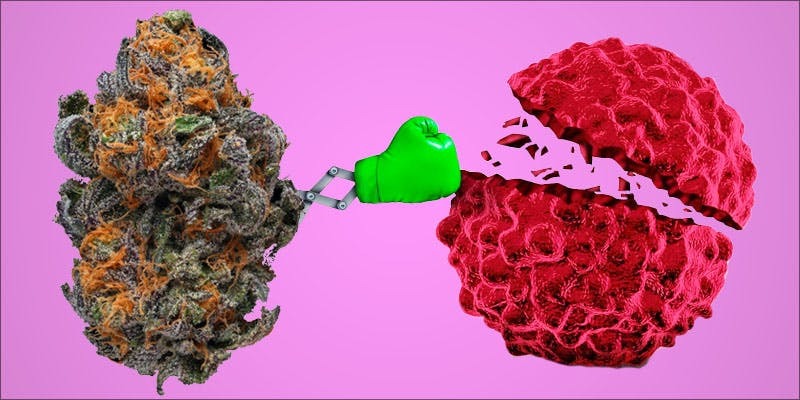 Here’s the scoop on the 100+ studies that suggest that cannabis kills cancer cells. Question: how long does it take before new medical research is used in doctor’s offices? Answer: 17 years. Research suggests that it takes almost two decades for new clinical trials to be effectively integrated into clinical practice. This gap is appalling, as it suggests that the care that patients are given is not reflective of the most up-to-date research. To make matters worse, this number refers to the amount of time it takes for doctors to use information from randomized and controlled clinical trials. Randomized, controlled, and double-blinded trials are considered the gold standard of scientific research. Controlled clinical trials happen after extensive experiments in cell cultures, animal models, and small human studies have demonstrated that a concept is worth exploring in the clinic. But, what about emerging research that hasn’t yet made it into clinical trials? For the most part, it is not recommended to make decisions about your health based on research that has only been completed in cell cultures and animals. Yet, thousands of medical cannabis consumers have decided to take the risk. Due to legal restrictions on cannabis cultivation and research around the globe, experiments using cannabis-based medicines have been blocked from reaching the clinical trial phase. Instead, over 100 peer-reviewed studies in cell cultures and animal models have shown that compounds in the popular herb demonstrate anti-cancer effects. Without legal support to encourage more clinical trials, patients can expect a long wait before cannabis medicines are effectively integrated into the clinical practice. Patients in need have already been waiting a long time. Research on the cancer-fighting properties of cannabis has been going for over three decades. Yet, archeological evidence suggests that the plant was used as a cancer aid as far back as 2,500 years ago. Already, research in glioma (brain cancer) has found that adding cannabis compounds to chemotherapy treatments lead to an increased one-year survival rate for patients. One reason why cancer cells are so problematic is because they continue to grow and divide. In tumors, this proliferation can interfere with normal bodily functions. Research suggests that at least two primary cannabis compounds halt the proliferation of cancer cells. These compounds are tetrahydrocannabinol (THC), the primary psychoactive in the cannabis plant, and cannabidiol (CBD), a compound that does not cause a “high” and is being explored for the treatment of epilepsy. Sometimes, cancer cells move from their original location to take up residence in another. This process is called metastasis and its how something like a breast cancer tumor can lead to tumors in the lungs. Research in cell cultures and animal models suggests that cannabis compounds prevent metastasis in certain types of cancers. For a tumor to grow, it needs to eat. Tumors grow blood vessels to capture vital nutrients and oxygen which helps them grow and survive. Preclinical research suggests that cannabis compounds prevent cancer cells from developing blood vessels, potentially starving tumors. Last but certainly not least, preclinical research suggests that cannabis compounds trigger cell suicide in cancer cells. While this may sound too good to be true, cell suicide is a natural phenomenon that goes by the technical term of apoptosis. Cells that are diseased or damaged naturally undergo apoptosis. For some reason, however, cancer cells stop responding to normal triggers that would otherwise tell the diseased cell to die. This enables cancer cells to continue to grow and divide. The ability of cannabis compounds to trigger apoptosis in cell cultures and animal models is one of the primary reasons why the herb is of interest as an anti-cancer agent. Want to look through some of these 100+ peer-reviewed studies yourself? The Earth Child has kindly created an extensive list for curious individuals to review. You can find the complete list here.